A BIT OF HISTORY You can thrive in times of loss IN CORIOLANUS, Shakespeare wrote, "when the sea was calm all boats alike / Show'd mastership in floating." Unfortunately, the seas are no lon- ger calm. This will cause some ships to sink, but opportunity does not go away. People still buy things, they just become more particular about what they need. 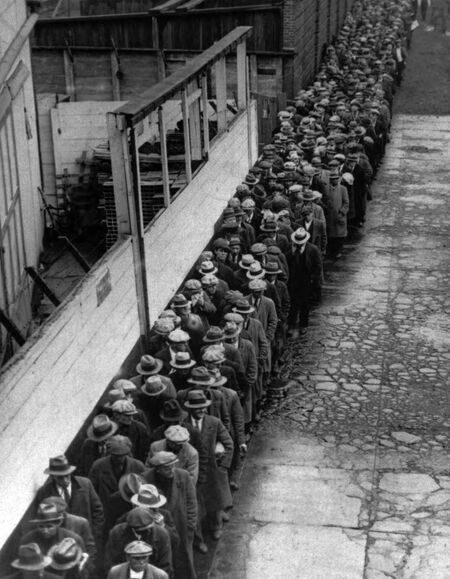 20 During the Great Depression, unemployment soared to 25%, 15,000 banks failed, and Wall Street was no longer a place of glamour. Four dreadful months into this depression, Henry R. Luce launched a pricey magazine titled Fortune. At $1 an issue, the cover price surpassed the cost of a func- tional wool sweater. Seemingly bad timing. Eight years later, Fortune had grown its subscriber base to 460,000 people. By 1937 the magazine reported an annual profit of $500,000. Scaled for in- flation, that amounts to more than 7 million modern-day dollars. That's a lot of wool sweaters. 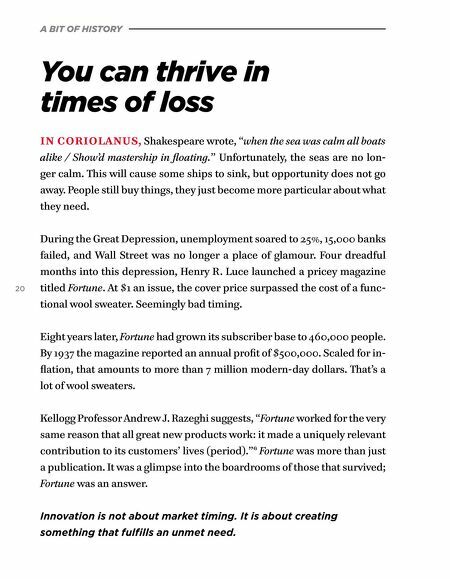 Kellogg Professor Andrew J. Razeghi suggests, "Fortune worked for the very same reason that all great new products work: it made a uniquely relevant contribution to its customers' lives (period). "6 Fortune was more than just a publication. It was a glimpse into the boardrooms of those that survived; Fortune was an answer. Innovation is not about market timing. It is about creating something that fulfills an unmet need.